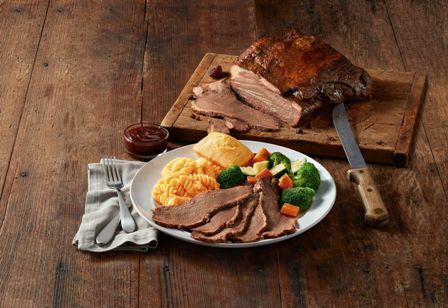 Boston Market has added Rotisserie Brisket to its menu as a new item following the success of its Rotisserie Prime Rib, which debuted last year. In response to strong consumer demand, locations will be increasing availability of prime rib from three to five days a week, with the remaining two days filled out by the new brisket offering. Brisket will take up rotisserie residency Monday and Tuesday, while prime rib will expand from Wednesday, Friday, and Sunday to cover Thursday and Saturday as well. Although best known by many as a chicken-focused eatery, Boston Market has a history with red meat, including a brief foray into brisket nearly a decade ago. Their first beef item was meatloaf, which entered menus in 1995. In 2005 the restaurant first introduced a specific cut of beef with a top sirloin menu item, and in 2009 they introduced brisket as a summer special.